The recipe for Chocolatey Fudge from Ricki at Diet, Dessert and Dogs was intimidating. It sounded easy and yes, so yummy, but could it really be that easy? I read and re-read the recipe and thought about my blender. Sometimes my wimpy old blender and I don’t get along but I am reluctant to learn a new machine along with a new recipe. Rita has a food processor stored here in my cupboard and next time I will definitely use it. You need a machine with ‘muscle’ for this recipe. The blender whined and groaned and started sending out smoke signals before we called truce. So this first batch has little bits of beans that are visible although not enough to stop any of my dedicated testers. And if you truly love deep, dark chocolate this will give you a chocolate fix without the sugar hangover. It looks like fudge, it tastes like fudge, and it IS fudge. You need to read Ricki’s version before you decide which way you would rather make it. She crumbles the unsweetened chocolate and adds it at the end. This version has it all melted in and fudgy smooth all the way through – almost the same ingredients but a different technique. This Fudge Is Really Good! Place chocolate in a small microwavable bowl and spoon the coconut oil over it. Heat this in the microwave for one minute. Test the chocolate with a thin knife. The coconut oil should be hot and the chocolate just soft and melted but still holding its shape. This might take several iterations of heating and testing. Do – not – overheat! Add all of the remaining ingredients to the processor and pour the coconut oil/chocolate mixture on top and blend until very smooth. Use a spatula to help push down and incorporate all of the ingredients if necessary. The mixture will be thick. If the almond butter is the least bit chilly the coconut oil and chocolate can suddenly harden and seize. Transfer fudge mixture to the loaf pan and press down to compress it and push out any air bubbles. I sprinkled a packet of Truvia over the top to give it a ‘sugary’ finish but the loaf just dissolved the crystals and it disappeared overnight. Allow the fudge to set up in the refrigerator for an hour, then cover the top with more plastic and refrigerate until very firm, 2 hours or up to overnight. Slice into squares. Because it contains no sugar to act as a preservative it needs to be stored in the refrigerator for up to 5 days. The SOS Kitchen Challenge ingredient for September is apples. There are so many varieties of apples in the market right now. Choose your favorite or one of the weekly specials. Usually I go for Golden Delicious but the Pink Lady variety is relatively new and entirely wonderful. Ricki at Diet, Dessert and Dogs and Kim at Affairs of Living. Be sure to check out the SOS Kitchen Challenge for September site for lots of other healthy recipe submissions by other bloggers. This is a naturally gluten-free treat that Don and I have enjoyed over the years. It began as apple pie with crust, canned pie-sliced apples, and lots of sugar, raisins, and cinnamon. The recipe morphed into baked apples after we received a set of individual ceramic baking dishes and decided that as a regular dessert it was better not to have all of that crust. After a while those convenient water-packed pie–sliced apples were no longer available so we alternated between baked apples from scratch or baked apples from pie filling enhanced with raisins and more cinnamon. The high-fructose-corn-syrup in pie filing always tasted like glue to me so I only ate baked apples when we used fresh apples. We began to experiment with the current recipe about ten years ago – while we were still living in the country. 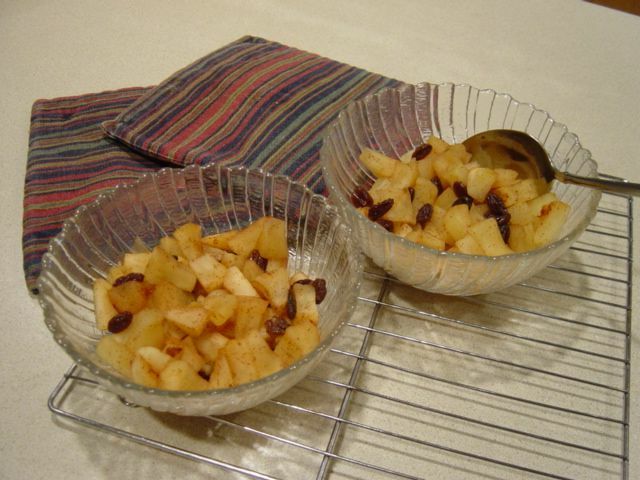 It was there that we settled on this mix of fresh, partially peeled apples, no-cal sweetener (I really was sneaky about the switchover), plenty of cinnamon, good vanilla to enhance the fruit flavor, and raisins. I always liked raisins. But no one I’ve ever known likes them as much as Don. His motto is ‘too many raisins is not enough’ – there is a song that goes something like that but it is not really about raisins. When we started using the microwave to cook in we switched from the ceramic bowls to inexpensive microwave-safe glass bowls so we prepare, bake, and serve all in the same easy-clean dishes. Start with freshly washed and dried apples. Quarter, seed, and peel or not peel to your preference. I like a little more peeling and Don likes less. Cut each quarter into small bites and place a cut up apple in each microwavable serving dish. Add the raisins – here Don likes more and I like less. 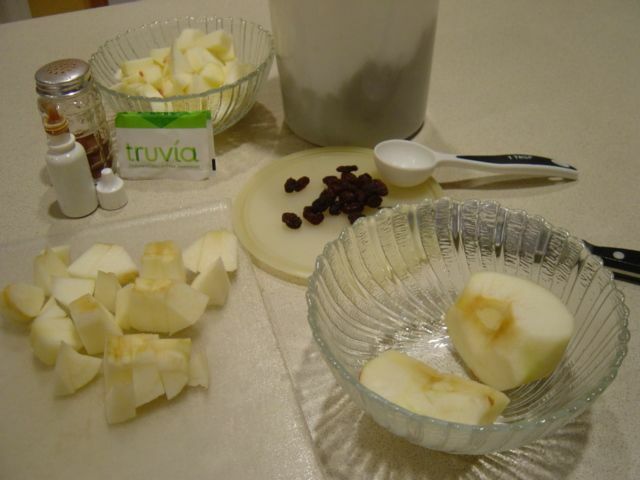 Then sprinkle the Truvia crystals over the fruit. Shake some cinnamon on top of the crystals and add the drops of vanilla. Stir to distribute then raisins and seasoning. Add some more cinnamon – almost always. Place the desserts in the microwave and set the timer for two minutes. Stir and cook for another minute. The apples will have started releasing juice and getting tender. The cinnamon, sweetener, vanilla, and apple juice are blending into a delectable coating for the apples and raisins. Microwave the mixture for one more minute. Remove the desserts to a rack and cover until somewhat cool. Right out of the microwave it will burn your tongue and that is not fun. This dessert is really good plain. The tart bites of apple with the sweet bits of raisin do not need embellishment. Top with a handful of chopped walnuts and you have breakfast. A tiny bit of fresh sweet cream, whipped cream, ice cream, full fat coconut milk, or a non-dairy frozen dessert makes an acceptable topping. One of those frozen-synthetic-low-fat-imitation-whipped-toppings is an insult to a good apple but if that is what rocks the boat for someone you love then you keep a tub of it in the freezer for them. Apples are in season and it is time to enjoy them! The SOS Kitchen Challenge is going on and I am not going to make the cut this month. There has been too much going on and did I mention that Central Texas fruit trees have me swamped in frozen and cooked, pureed fruit? So if you love peppermint you need to check in with Ricki at Diet, Dessert and Dogs and/or Kim at Affairs of Living for fabulous MINT recipes, mint being the challenge ingredient for August. During the next few months I will be looking at ways to create gluten-free recipes using mostly staples found on the shelves at The Caring Place food pantry. The organization is in the process of stepping up to the next level in service and has formed a focus group to look at useful options. I will be looking at making gluten-free easier for people who do not have the luxury of time to experiment. So right now I am finishing up a few experiments that have been rattling around in my head. This afternoon it was using puree I had prepared from fresh figs. Rita was laughing at me as I sniffed the batter and tried to decide what flavor options to emphasize and how to do it. She giggled and accused me of ‘huffing spices’. And I was so engrossed I forgot to take pictures along the way. Happily this is not just good cake it is REALLY GOOD. We are planning on having some more of it for breakfast in the morning. Place the figs, water, and syrup in a 1 quart saucepan that has a heavy bottom and a tight fitting lid. Place the pan on the stove and turn the heat on low. Be patient while the heat begins to ‘melt’ the figs and draw out their juice. The lid on my pan was glass so I could watch the steam gather and begin to baste the fruit. The figs should cook until tender but don’t boil them to pieces either. Stir occasionally so all of the pieces are evenly cooked. The flavor is delicate and you want to keep as much as possible. Remove the pan from the stove to cool when the fruit is done. When it has cooled somewhat then transfer the mixture into your blender jar. Push the button that says ‘puree’ and watch carefully. You may need to scrape down the sides for an even texture. This should not take more than a minute or so. Small bits of pulp are a good thing. Take a tiny taste – if it is not ‘fruity sweet’ then add a few drops of stevia to help it out. This should give you the amount of puree needed for the cake. A little more or less is OK. If the cake has more moisture then it will just bake a little longer. Note: this can be stored in the refrigerator for several days before putting into the cake. 1. Pour the fig puree into a bowl. Sprinkle the chia seed across the surface and stir in quickly so it doesn’t have a chance to clump. Do the same with the pectin. Stir in the coconut oil, vanilla, and lemon oil and set the mixture aside. 2. Sift the dry ingredients into your mixing bowl, stir with a whisk, and set aside. 3. 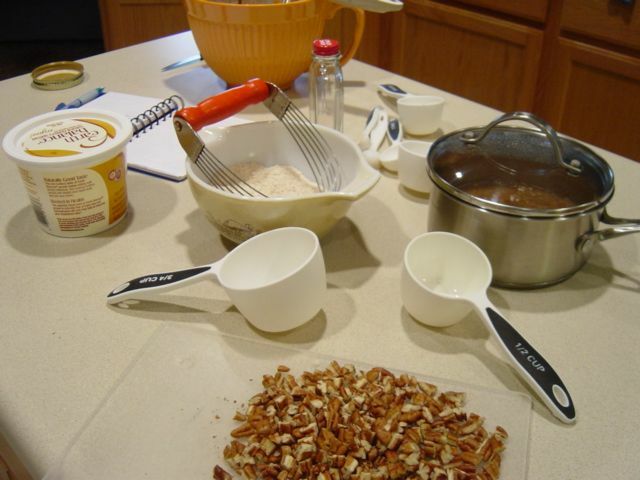 Prepare the streusel topping by mixing the flour, Truvia granules, and spices together. Cut in the margarine (or cold coconut butter) with a pastry blender. Add the chopped nuts. Lightly stir in the syrup with a fork. Then set this aside. 4. Turn the oven on to 350*F. Lightly oil or spray 2 9” square pans and set aside. Stir the fig mixture quickly into the flour mixture. Divide the batter into the prepared pans and spread out evenly to the corners. 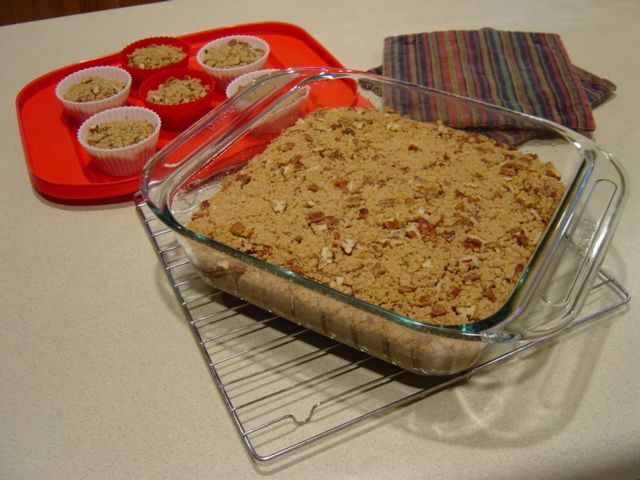 Then carefully sprinkle the streusel mixture on top and press gently into the surface of the batter. Bake for about 25 minutes. If it still seems a little too moist then turn off the oven and let it remain for 2-3 more minutes in the residual heat. Most of the ingredients are nutritional superstars. This treat can be dessert or a meal. The flour ingredients are exactly the same as the Rhubarb-Date Pecan-Crumble recipe. The changes were the base puree and the spices and flavoring. I plan to experiment with different fruits and even mixing fruit and veggie, for instance banana or white squash with lemon and encourage others to play with it also. The ingredients that give this cake texture and post-baking stability are 1) chia seed stands in for an egg and 2) the fruit pectin combines with the acid in the fruit and the sugar in the agave to form the gel that produces jams and jellies. This was a surprise, although a good one – the poisonous leaves were already eliminated and I refuse to speculate on that. After a thorough washing it was time to dice. 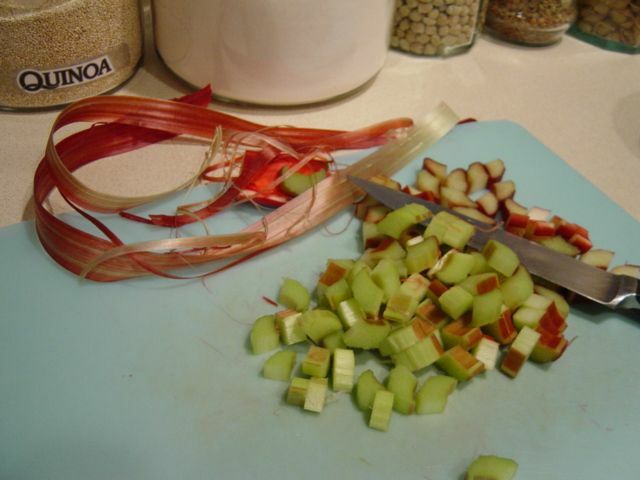 I had a recipe for an applesauce coffee cake that was my baseline for this attempt and dicing the rhubarb into 1/2” – 3/4” pieces was the first step. But what’s with all the string? This is way stringier than my beloved celery. So into the saucepan it went; along with some chopped dates to sweeten it up, a bit of water and agave syrup for the cake. 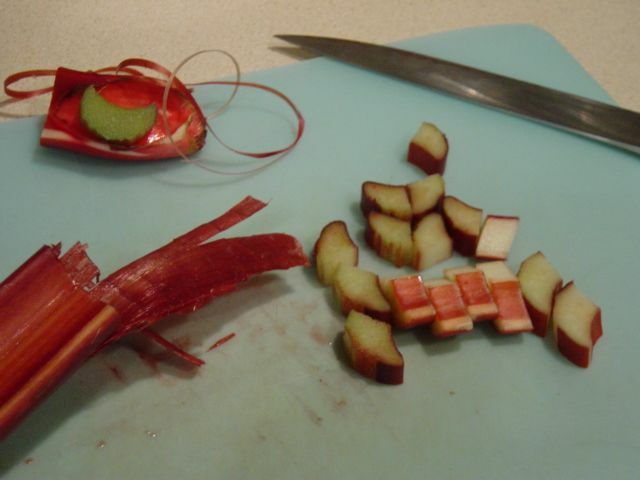 It simmered gently until the rhubarb was coming apart. I had failed to note that the original recipe included tofu and my system can’t handle that. So then began the mental scramble that usually results when substitutions are necessary. There were also flour modifications in keeping with my whole ‘no-grass-plants-allowed’ mindset right now. It became an all-out juggling act. Plus my square pans are all 8” so several cupcakes took up the extra batter and crumble topping. The crumble topping is messy and umm, crumbly. Maybe next time a layer of batter, crumble for filling, and the batter on top, kind of like the once popular sock-it-to-me cake. Put the rhubarb, dates, water, and syrup in a saucepan and simmer slowly for about 10 minutes. 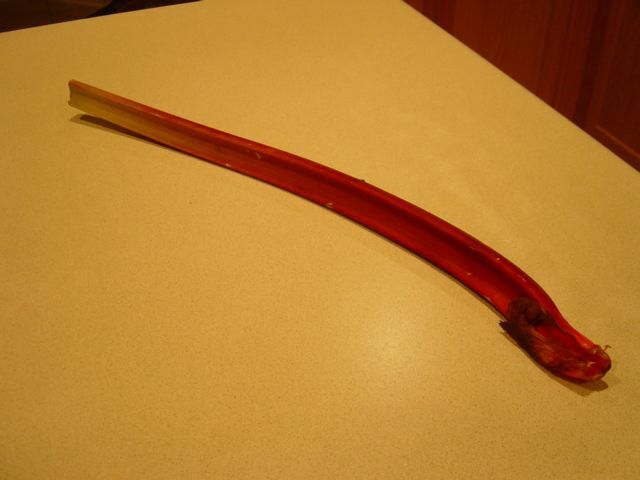 The rhubarb should be very soft by then. Remove the pan from the stove and allow to cool. Stir in the chia seed, pectin, coconut oil, and vanilla and set aside. Sift the dry ingredients into your mixing bowl and set aside. Prepare the crumble topping by mixing the flour and cinnamon together. Cut in the margarine (or cold coconut butter) with a pastry blender. Lightly stir in the syrup with a fork. Then add in the nuts. Turn the oven on to 350*F. Lightly oil or spray a 9” square pan and set aside. The rhubarb mixture should be fairly cool by now. Stir it quickly into the flour mixture. If the batter is really thick then add the 1/4 cup of milk. Scrape the batter into the prepared pan and spread out evenly to the corners. Then carefully spoon the crumble mixture on top and spread evenly also while pressing gently into the surface of the batter. Bake for about 35 minutes. If it still seems a little too moist then turn off the oven and let it remain to bake for 5-10 more minutes in the residual heat of the oven. Allow the cake to cool thoroughly. As with many of these stronger flours it will be better the longer it cools. It is really best if you can make it a day ahead. Postscript: The Sit ‘N Stitch ladies were at Barb’s house today and I brought this over for taste testing. This little cake went over very well. So the question is: if people appreciate the taste of nutritious food then why doesn’t the food industry provide it? 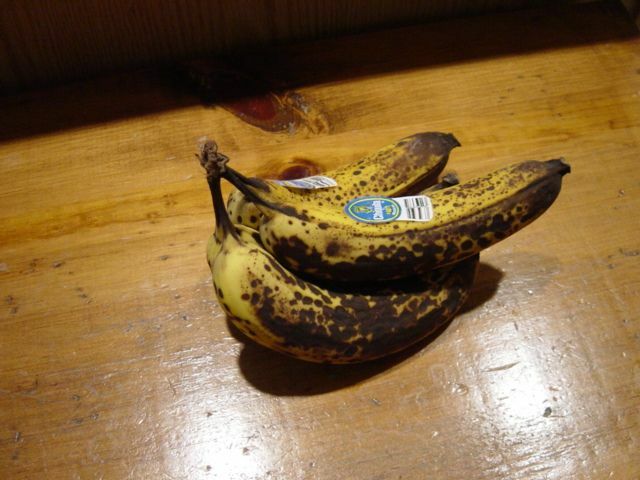 It could be done . . . .
Those four-week-old over-ripe bananas finally were rescued. I love bananas but Don does not. Consequently it took me awhile to get around to preparing a recipe that could not go into the freezer to be used up gradually. I had been dreaming about trying something like this but now it was time to buckle up and go for it. Unflavored gelatin, a can of coconut milk, Mexican vanilla, stevia, and those four bananas went through the blender. The creamy result was poured in a mold and put in the refrigerator to set up. The liquid tasted a bit astringent – bananas and coconut milk each have a bit of that quality. By the time we returned from the fitness center it had set up and was ready to unmold. The astringent quality had mellowed. By the next morning (Panna Cotta for breakfast is like having ice cream for breakfast – decadent but still healthy enough) the astringency had mellowed even more. But then I thought I noticed the bananas in the panna cotta were causing it to darken and change color as if the bananas were continuing to ripen even more! 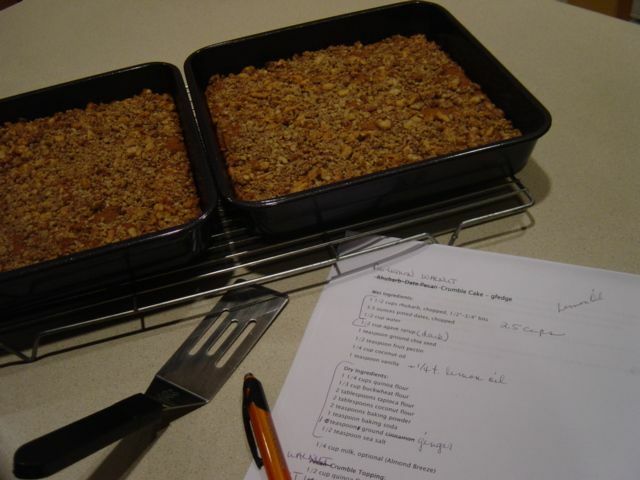 1) Plan ahead – if it is made with bananas then you really need at least six or more people on hand to share it with. 2) Or, make it with apples – sautéed with a bit of coconut oil, sweetener, and cinnamon so that there is about 1 1/3 (a bit more or less) cups of apple to pulse in the blender. I’m going to try it this coming weekend when we have another cold front coming through (the kitchen will be a warm, cinnamon-scented refuge). My beloved husband loves apples so I can depend on him help me evaluate an apple version. Assemble and plug in the blender. Place the prepared fruit into the container. 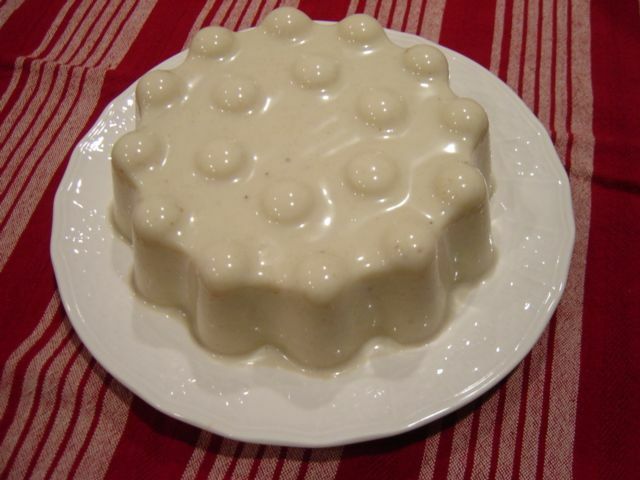 If you plan to use a mold you need one that will hold 3 cups of liquid and give it a very thin coat of Pam or coconut oil to help the panna cotta to unmold. You will still need to dip the mold in hot water for it to release neatly onto your serving plate. Add the water to a small stainless steel saucepan. Sprinkle on the gelatin and add in the vanilla. Allow the gelatin to absorb the liquids and swell up. Then place the pan on the stove and turn the heat on very low. Slowly melt the gelatin. Pick up the pan occasionally and tilt to move the grainy bits around so they will melt more evenly. When all of the mixture is nearly melted use a metal spoon to gently pull any remaining unmelted grains out from the edges into the center of the pan (this IS tedious but essential). The gelatin must be completely melted before it will blend with the remaining ingredients. Unmelted gelatin will not congeal and the panna cotta will not ‘set’. When the gelatin is entirely melted then quickly pour in the entire can of coconut milk, set down the can and stir the mixture to distribute the gelatin throughout the coconut milk. Scrap any remaining milk and solids from the can into the pan. Turn off the heat but leave it set for a few minutes. Turn on the blender and pulse gently to puree the fruit. It doesn’t take but a few moments. Too much will oxidize the fruit, turn it brown, and degrade the flavor. Pour the warm mixture from the pan into the blender jar with the fruit. There should be about 3 cups of liquid altogether. Blend the mixture for about 30 seconds before pouring into a bowl or prepared mold. Chill for several hours until it is completely set. 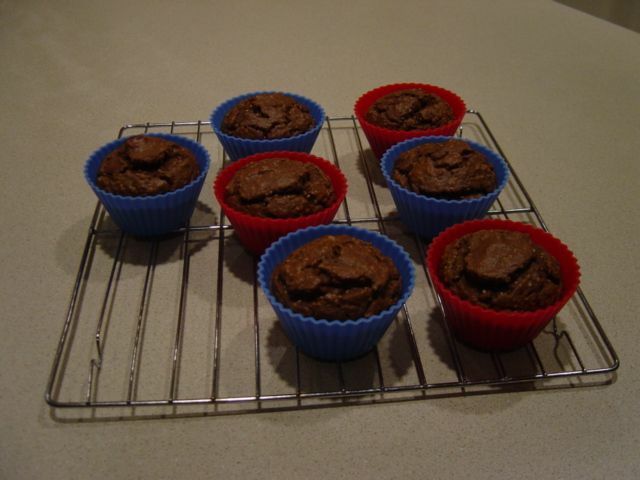 These petite muffins are densely nutritious and very filling. 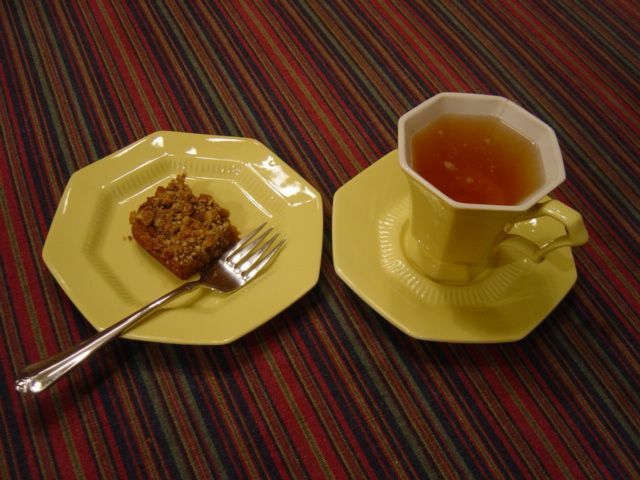 They make a wonderful first breakfast with a cup of coffee or tea and/or a delightful little afternoon snack. 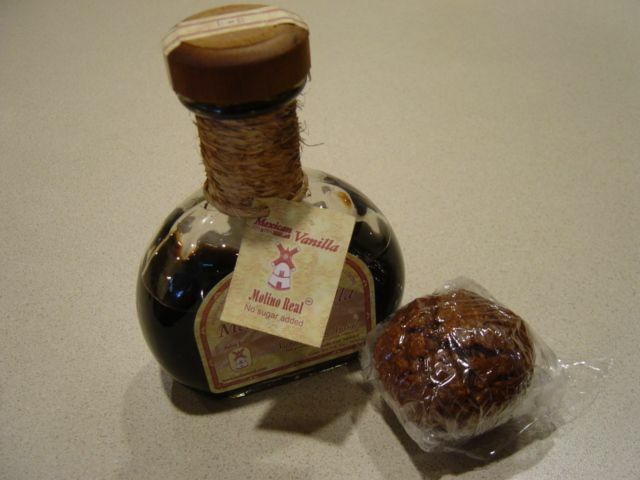 The Mexican vanilla described above, along with the coconut flour, gives them a delightful fragrance. I shared these with friends at The Caring Place for expert opinion as they are not very sweet. Clara, who has gluten issues, gave it two thumbs up. 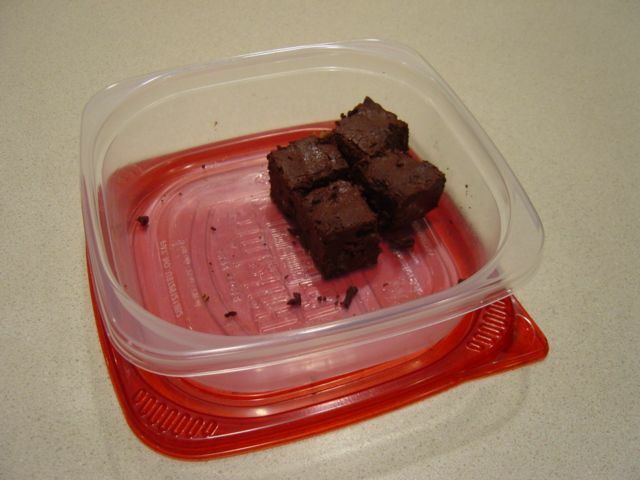 Ann, who does not have gluten issues and has much baking experience, also gave the recipe a high rating. I love it when friends from both sides of the gluten equasion equally enjoy a recipe. I used dried cranberries which added a bright touch of color to a light colored muffin. Adapted from Salba Banana Coconut Muffins (GF) at the Salba.com. Sift and whisk together the baking powder, salt, cinnamon and coconut flour (it keeps better in the freezer but it does get clumpy) in a medium mixing bowl. Add the chia seed, coconut, and optional ingredients and whisk again to blend the dry ingredients. Whisk together oil, eggs, banana, and vanilla in a small bowl. Pour into the dry ingredients and whisk until well mixed. Measure spoonfuls of batter into silicon muffin cups or a muffin pan greased with coconut oil. I used a large size kitchen scoop (50 ml – 10 teaspoons) and filled the silicon muffin cups to the inside line which produced seven muffins. Bake 15 minutes or until toothpick inserted into the center of a muffin comes out clean. Cool on a wire rack for 5 minutes and then pop out of the pan or liners. Serve immediately or wrap individually for later use. The flavor seems to improve/mellow after wrapping and cooling and the fragrance comes through the wrapping! Even with the banana and cranberries these muffins have only about 11 grams of carbs with 4 grams of fiber, 4 grams of protein and a very low GI index which makes them ideal for these post-holiday low-carb high-protein diets. These Sunsweet ONES are one of my ‘emergency food’ selections. Heading out the door for a round of errands I grab my bottle of water and throw a few of these in my pocket or purse. They are a sweet treat in a naturally healthy package of vitamins, minerals, fiber, and anti-oxidants. Each one is about 25 calories so you can choose to have one or a handful. They do not melt or ooze a sticky mess in the bottom of your pocket or purse. These ‘ONES’ became a favorite after several individually wrapped chocolate mints melted into the bottom of my good summer bag. ‘Emergency food’ saves time, is gluten-free, healthy, and usually more economical than grabbing something at a convenience store when you are having one-of-those-days.